By R. Van Bergen. 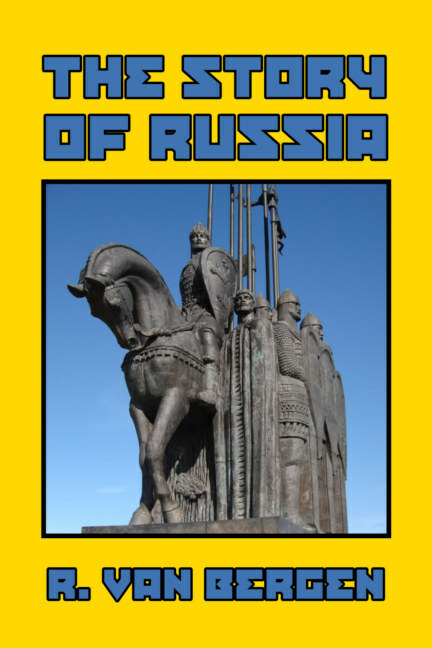 Written just after the end of the Russo-Japanese war of 1904, this masterful history of Russia from its earliest times captures the spirit and essence of the creation of Tsarist Russia. Written by a visiting American scholar, this book is unique in that it spelled out precisely the racial reasons for much of Russia’s turmoil, from the brutal invasion by the Huns to the centuries’ long occupation by the Khanate in the south. Starting with the earliest known historical inhabitants—the Scythians—this work moves through each phase of Russian history, encompassing the arrival of the Indo-European Slavs, the Viking Rus, the creation of the great capital cities of Kiev and Moscow, the emergence of the Tsars—and the terrible effects of the Asiatic invasions. “No one knows what the morrow will bring, either to us or to the Slav. Yet it seems absurd to suppose that, after the lessons of corruption and incompetence of the present government, the educated Russians will remain quiescent while the great empire continues on its downward course. About the author: Robert Van Bergen M.A. was one of the first Americans to enter Japan after that nation ended its centuries of isolation following the famous Admiral Perry incident, and won renown in the Asiatic nation for teaching English to its nobility, becoming Principal of the Nobles’ School in Tokyo. While there, he wrote the first comprehensive histories of Japan to appear in English, and acquired considerable additional fame in the West as a result. Later, his visits to Russia intrigued his curiosity as to the nature of the Tsarist regime, prompting his famous history of that nation.